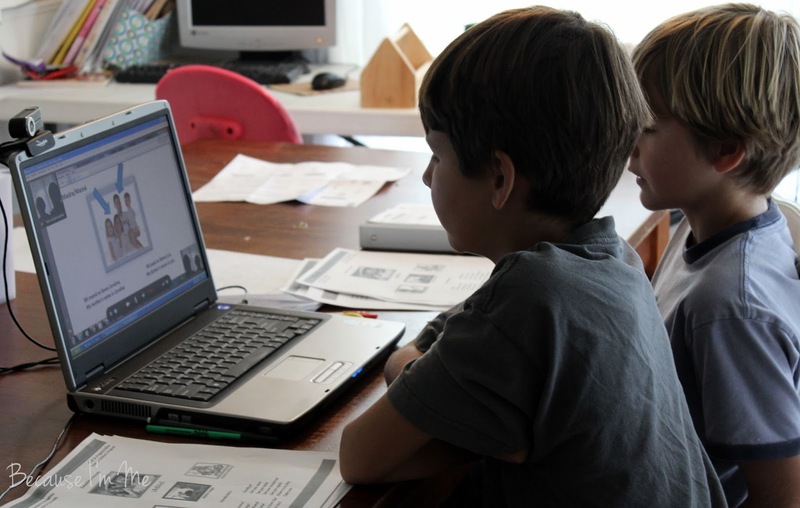 Homeschool Spanish Academy is an online interactive Spanish program. 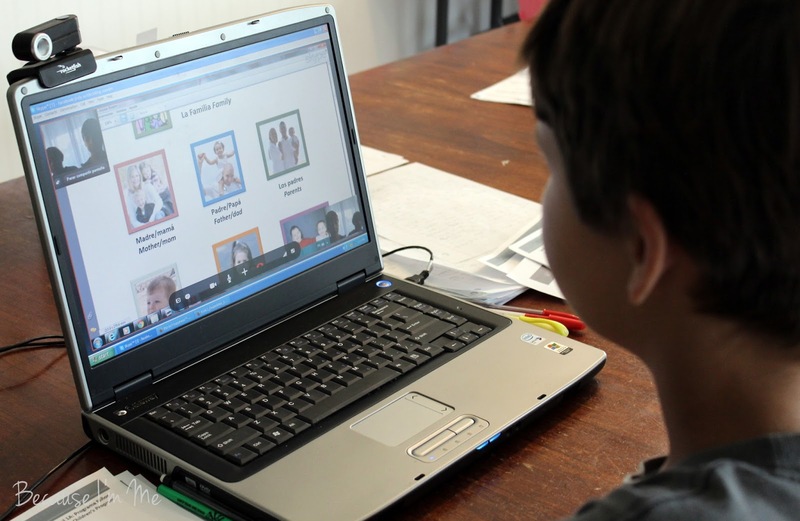 The curriculum uses Skype to bring the teacher and student together for the class sessions, allowing for immersion Spanish lessons. Adam (12) and Kaden (10) were able to do this course together, both sitting in on the same lessons. The program we used was the Early Language Program, available for children ages 5-8 and 9-12, with different curriculum for the two age groups. Homeschool Spanish Academy offers a variety of programs available for ages 5 to adult. To begin, I had to make sure we had a webcam and Skype set up on the computer. The Homeschool Spanish Academy service department called and talked me through the Skype set up, making sure we were ready for the first lesson. The gentleman I spoke to very kindly and patiently helped me out, answering all my questions and repeating the instructions until we were both certain everything had been done correctly. Having never used Skype before I'm sure I asked every question imaginable and he was able to answer each and every one. My oldest son was in the background laughing at me (be nice, kid, Christmas isn't that far away!). And then I closed Skype. The phone rang at the appointed time of their first lesson and, oops, she'd been trying to reach the boys through Skype but couldn't. Once I learned that Skype was supposed to stay on the lesson began. Their teacher, Ms. Rosa, was so sweet and warm with the boys. Within a few minutes they were saying "Hola" and she was teaching them simple basics. After the lesson, and each following lesson, the boys were given homework to complete before the next lesson, which Ms. Rosa would check by having them show it to her. For Lesson #2 the speakers stopped working. For Lesson #3 the video wouldn't work. These problems were on my end and had to do with my computer. When these problems arose I was called and assisted by customer service and the lessons were reset so they didn't count as completed lessons, which went beyond my expectations as these issues were 100% my fault and I'd guess the teacher still had to be reimbursed for that time. Wonderful customer service. For the record, for Lesson #4 and beyond we used a different computer and it worked perfectly. During the first few lessons I stayed where I could hear what was going on. It wasn't my lesson, so I let the boys do it on their own. After the first few lessons I let the guys know where I was and left the room with River, to keep him from "Skype bombing" their lesson. Their teacher couldn't have been a better teacher. While I'm sure she has a lot of students she kept track of the boys progress and had a very personal approach. She corrected and guided them as needed, always remaining warm and friendly. For one lesson we used a different teacher, to see how the transition would be between one teacher and another. Because the teachers keep such good notes on the kids the flow of the lessons was maintained and it went very smoothly. Homeschool Spanish Academy does recommend using more than one teacher on occasion so the kids hear different accents and experience different teaching styles. The lessons are 25 minutes long and the student is expected to complete one lesson per week and do their assigned homework. My initial thought was that that wasn't enough for them to learn anything, but the boys did learn and really retained what they learned. Having that one-on-one attention and interaction allows them to get a lot out of each lesson. One of the benefits I saw with the interactive lessons was that when the boys made a pronunciation or grammatical error Ms. Rosa corrected it immediately, before they had time to develop a bad habit. Adam and Kaden really liked these classes. They'd look forward to them and eagerly wait for Rosa to call on the computer. According to Kaden, "I think we learn a lot and it's fun to do. It's nicer on the computer because you actually get a real teacher instead of a book." Adam's thoughts, "I think we learned a lot about something we didn't know about before." Adam did add that he didn't love the interactive aspect, he's a quieter child and is happier to work independently at his own pace, being the center of a teacher's attention made him a little nervous. Classes can be scheduled one at a time which was great for us as our schedule isn't the same every week, or for the same time and day each week if that works best for the family. Homeschool Spanish Academy's Early Language Program is available for $5.83-$8.57 per class for one child and for $8.57-$12.86 per class for two children. The pricing varies based on the quantity of lessons purchased and the complete pricing chart can be found here.